During a tension filled meeting earlier this month, the South San Luis Obispo County Sanitation District Board members voted unanimously to add Oceano residents’ sewer charges to their property tax bills. Even though her spouse became outraged during the meeting, Oceano Community Services District President Mary Lucey voted with her fellow board members to send the bills to the tax collector. Lucey, who failed to pay her bill until it was publicly noticed as delinquent, has argued that it is unfair for Oceano residents to have their bills added to the tax rolls, while Arroyo Grande and Grover Beach residents’ sewer bills are included with their water bills. During the meeting, Lucey’s wife Nancy MacNeil began screaming and disrupting public comment because she didn’t agree with a speaker. 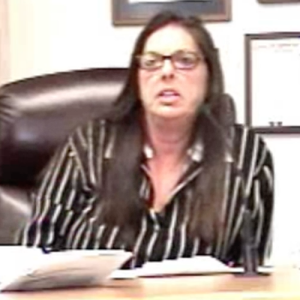 While MacNeil blames sanitation district staff for the billing dispute, Julie Tacker said she thought Oceano Community Services District officials were responsible. John Shoals, the sanitation district board chairman and Grover Breach mayor, told MacNeil to quiet down. However, after Tacker finished her comment, MacNeil again began screaming as she walked to the podium. Shoals told MacNeil to sit down, she had already had her allotted comment time. Even though Shoals threatened to shut the meeting down, MacNeil ignored him and yelled louder as she continued with her tirade. Oceano, like the cities of Arroyo Grande and Grover Beach, use to do its bill collecting for the sanitation district by adding the cost of sewer bills to customers’ water bills. For more than a decade, Oceano charged the sanitation district $4,930 a year for bill collecting. Then, during a time of financial shortfalls, former Oceano CSD general manager Tom Geaslen sent the sanitation district a bill for more than $60,000 a year. However, former sanitation district administrator John Wallace rejected the bill. In 2013, the Oceano Community Services District Board fired Geaslen after an audit revealed that he had paid himself more than $45,000 extra in salary. Around the same time, amid allegations of mismanagement, Wallace announced his retirement. Shortly afterwards, an interim Oceano CSD manager sent a bill to an interim sanitation district administrator for $22,000 a year for billing services, and it was paid. After new management discovered the non-board supported increase, they asked Oceano staff to provide a cost analysis, but determined the costs were too high. Oceano CSD Manager Paavo Ogren then threatened to stop providing billing services unless the sanitation district agreed to pay Oceano $22,000 a year. Instead, the sanitation district board voted to send Oceano residents’ sewer bills to the tax collector at a yearly cost of $7,700. Why does it matter where a person is billed? You are gonna pay regardless. I honestly don’t care if they put it on my water bill or my property taxes, so long as it is only in ONE place. A homeowner will pass this cost along to the renter regardless, and the homeowner will be paying water/trash and property taxes anyway. She and her wife needs to get out now!!!! Many times the very first people to push their way onto boards and committees are the last people that have any business doing so.